John Kowalsky may be the most famous Veronian that few have heard of. He was born in Buffalo County, Wisconsin in 1867 to Joseph and Rosalia Kowalsky and in 1898 there is evidence that he lived in Apollo, PA and was manufacturing bicycles. He met his wife to be, Annie Ecker, while living in Apollo. No record has been found of what brought him to Verona, but he arrived here during the early 1900’s. After arriving in Verona, he opened John Kowalsky Motor Works in 1902, at Fairview and Arch Streets adjacent to the Allegheny River. The John Kowalsky Engine Company at Grant Street and Railroad Avenue, manufacturers of marine and stationary gas and gasoline engines, was incorporated in Delaware in 1906. Harvy Miller was the president and general manager, his brother, Rueben Miller, Jr. was VP and treasurer, and G. E. Flaccus was secretary. Although the company’s primary business was manufacturing engines, John Kowalsky was a genius inventor and spent a great deal of time dreaming up new inventions. A story has been told that the boat was so fast that it was banned from the Allegheny River. During a test run, Kowalsky was actually thrown out of the boat. Unable to use the boat, he sold it to a Detroit businessman who was able to use it on Lake Michigan. Cameron Waterman visited Verona in 1908 to meet with John Kowalsky. He wanted to purchase the rights to manufacture a two-cycle two-cylinder engine, referred to as the Model X, which Kowalsky was manufacturing at the time. One can only speculate that Cameron Waterman was the “Detroit businessman” who purchased the incredibly fast boat. Before Waterman returned to Detroit, he offered Harvy Miller an executive position in the Waterman Marine Motor company. Harvy accepted and moved his family to Detroit. 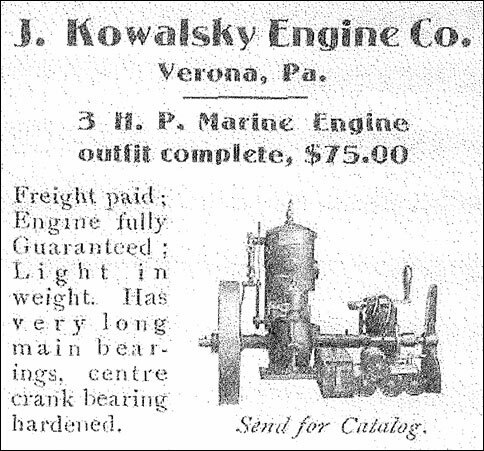 This may have been the end of the John Kowalsky Engine Company, although Kowalsky continued to manufacture marine and aeroplane engines, there is no evidence that a legal company existed after this time. During the 1900’s the United States was in the midst of a race to build the first aeroplane. Kowalsky completed work on his first aeroplane in 1910. It was powered by an engine he invented and had wings that resembled bird’s wings. The arched wings were designed for a double purpose; in event of a failure, they would serve as parachutes. On July 2, 1910, hundreds if people showed up to witness the inaugural test flight at what is now Waterworks Shopping Center. Using Freeport Road as his runway, he was able to gain enough speed to lift off and fly for 75 feet. Although only inches off the ground, he considered the test a success. 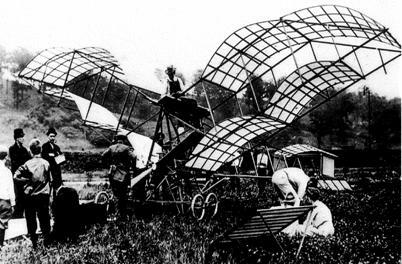 After the flight, the plane was disassembled and transported to Schenley Park, in Pittsburgh, PA for a 4th of July demonstration. Kowalsky planned to use the Schenley race track as his runway but city officials would not permit it. Kowalsky cancelled the flight and took his plane home to Verona. By May, 1911, Kowalsky had completed his second aeroplane. This one was a bi-plane powered by another Kowalsky invented engine. The engine was a four cylinder, with 52 horsepower and the plane featured newly designed landing gear. Again he took the plane to an area in Fox Chapel for the test flight. This plane was able to ascend to fifty feet but ended abruptly in a tree. Kowalsky believed the problem to be a defect in the steering mechanism. After correcting the problem and repairing the plane a second test, on July 27, 1911, was enormously successful. The plane took off gracefully, flew over the test area and landed equally gracefully. The residents of Verona were very proud of their hometown hero and rushed from their homes to witness his flying each time they heard the whine of the engine. 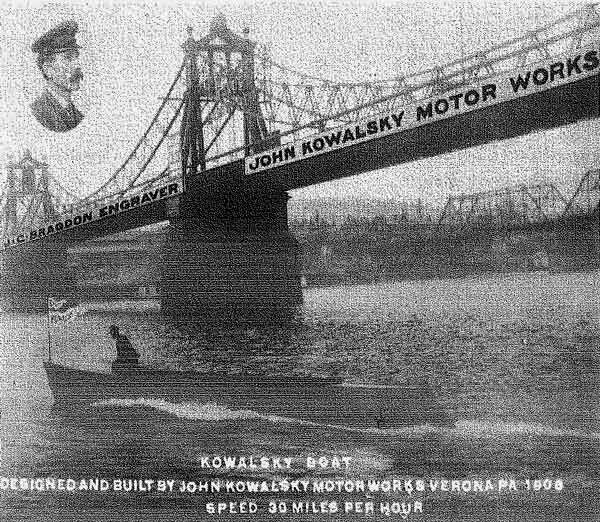 Kowalsky even replaced the wheels with pontoons and was able to land and take off from the Allegheny River. In June, 1911 a major demonstration for the general public was planned at the race track on Neville Island, Pittsburgh, PA. During a preliminary test flight, Kowalsky noticed a storm approaching and wisely landed the plane and placed it under protective cover then sought protection for himself. The storm had heavy downpours and strong gusty winds which heavily damaged the plane, forcing the cancellation of the demonstration. Obviously, he just kept trying because on September 27, 1911 the Pittsburgh Press reported that he crashed during landing suffering broken ribs. An assistant, Raymond Simpson, and an observer, Raymond Acker, rushed to his assistance and took him to his home on West Railroad Avenue where he was attended by Dr. B. L. Calhoun. Undaunted, Kowalsky began work on a new plane utilizing the lessons he had learned with the design of his previous planes. 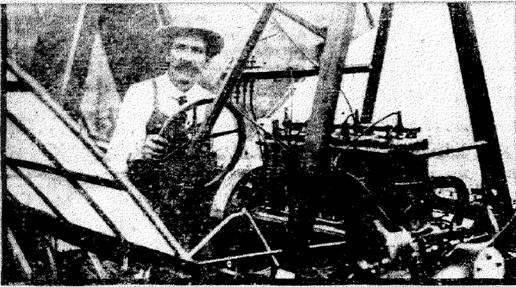 Several test flights that took place in O’Hara Township are documented in the Pittsburgh Press. He held a demonstration flight over the Allegheny River for the citizens of Verona and Oakmont on September 28, 1912. One time Kowalsky took on a partner, a Punxsutawney resident, Theodore Stockman. Their ultimate goal was to establish an airmail service for the Allegheny Valley. This plane, powered by another Kowalsky 8 cylinder, 80 horsepower engine, was taken to Tarentum, PA in August, 1913. The absolutely perfect test flight, with Stockman as the pilot, was on August 23rd. An announcement was made that a demonstration would take place at the local Labor Day celebration. The 8,000 people that showed up were thrilled as they witnessed the plane do a perfect take off, circle above their heads and land gracefully. Their amazement and appreciation sparked a spontaneous collection of funds netting $50 from the local businesses, and $45.10 from the onlookers. On September 10, 1913, during at planned flight to deliver mail with a landing scheduled for Schenley Park, Stockman ran over a small trench during take-off which tilted the plane forward, shattering the propeller. The plane was repaired, but during the test flight, Stockman encountered a strong cross wind which caused the plane to plummet to the ground, pinning Stockman underneath. Onlookers rushed to help and discovered that Stockman had miraculously survived but the plane did not. Although Kowalsky and Stockman planned to start again, it never materialized. The mail was taken to the Verona Post Office and processed on October 17th. *water pumps. 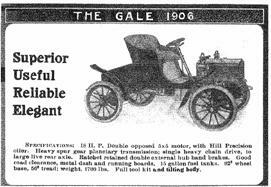 In 1906 John Kowalsky operated one of the first automobile dealerships in the area selling Gale and Orient Buckboard automobiles. 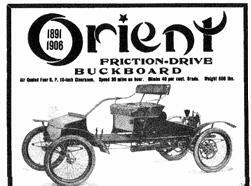 One invention was known as, “Kowalsky’s Duck.” It was an amphibious vehicle shaped like a car in the front, and a boat in the back. After backing into the water, the boat-end became the front end. The vehicle was powered by a 6 cylinder engine and was capable of carrying 30 passengers. Kowalsky envisioned selling the vehicles to the US Army, but that never materialized. John’s lack of business acumen persisted and as he grew older, he was forced to take odd jobs as a means of support. He was hired by Cy Woodings, owner of a Verona hardware store, to repair tools and equipment. He also made money on the streets of Pittsburgh by offering to show people “The World’s Smallest Electric Motor” for 10₵. Sadly, the motor did not achieve recognition until after John’s death, eventually being displayed in “Ripley’s Believe it or Not Museum”. Kowalsky’s eccentricity and lack of funds also caused the collapse of his marriage. Reportedly, his wife took his 6 children and returned to her family in Ohio. It is rumored, but unconfirmed, that he lost $50,000 in a bank crash during the Depression. In October, 1935, at the age of 73, Kowalsky’s neighbors reported to authorities that he was acting “childish”. John was taken to Woodville State Hospital and the county sheriff boarded up his workshop. Kowalsky died on February 10, 1940, while still at Woodville but there was no one left to claim his body. A sympathetic group of Verona businessman had him brought back and buried in St. Joseph’s cemetery, Verona. John Kowalsky was a genius inventor that never seemed to achieve the recognition he may have been entitled to.